Learning how to putt in golf is a daunting task for many golfers. But the reality is the putting stroke is the simplest, shortest and slowest stroke we make in all of golf. So, why is it that so many golfers struggle with the so called yips and other putting woes that ruin the game for so many would-be great putters? I have a simple drill is going to help show you that you really aren’t that bad of a putter, rather the victim of some mis-guided advice. This putting drill will help you learn how to putt naturally and make the game much simple for you while making the putting stroke more natural and athletic. How to Putt in Golf - Just Rock the Shoulders? You have to realize is that a lot of things in the putting stroke are taught in a way that makes it very difficult for the average golfer to learn how to have a fundamentally sound putting stroke and good distance control. To get the feeling of distance control you need to look no further than your right hand as most golfers are right-handed and that’s where all the feel and sensitivity and touch come from in the putting stroke. Yet they don't use the right arm and hand during the putting stroke as it is commonly taught to do nothing but rock the shoulders and keep the hands locked firmly in place. 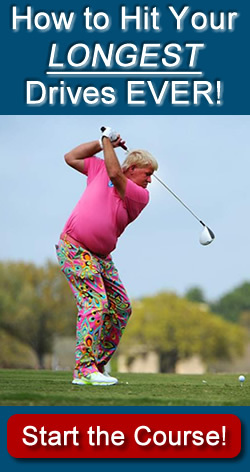 But the reality is all of the best golfers from all eras used the right arm and wrist in their putting strokes to some degree, including putting greats such as Jack Nicklaus and Arnold Palmer to even Tiger Woods. So if you take that right hand completely out of the putting stroke while learning how to putt and just rock the shoulders you will have a very difficult time controlling the distance and speed of your putts. 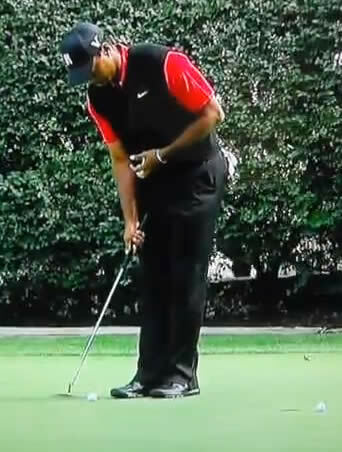 Tiger Woods performing the "How to Putt for Distance Control" drill you're about to learn. To retrain yourself that it’s ok to use your hands slightly in the putting stroke, take a golf ball in your right hand while holding it softly in your fingertips and roll it at the hole. If you do this 10 times you'll find that you're actually quite skilled at getting the ball to stop somewhere near the hole. Now try to take your right hand out of it and lock it to your body while trying to just rock your shoulders and toss the ball and note how much more difficult it is for you to get the ball near the hole consistently. It will be a struggle because your shoulders and big muscles of the body aren't nearly as skilled with fine motor movement as your wrist and arms are, and that's what putting really is - a fine motor controlled movement. This little experiment should let you know that your arms and hands and wrists shouldn’t be taken completely out of the putting stroke if you want to have any sense of distance control. Letting your right wrist hinge slightly during the stroke will give you a keen sense of feel and touch for distance and keeping your arms soft while rocking the shoulders will have your putts finishing near the hole very quickly, even if you've struggled with your putting for years. So the next time you work on how to putt, take a look at these drills below that will help you learn how to putt with your right hand for distance control and then learning how to focus your mind while putting so that you get out of the mindset of simply focusing on your putting stroke. You’ll be holing more putts in no time!